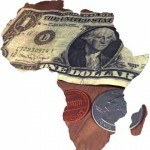 Only whisper it, but economic boom is coming to Africa. Yet this boom is not just coming from the continent’s natural resources, though they have surely helped, but rather less traditional business such as retail commerce, transportation, telecommunications and manufacturing. This economic growth is set to bring huge benefits to the people of Africa. An African Development Bank (AfDB) report projects that much of Africa will retain lower-middle and middle-class majorities by 2030, with consumer spending increasing from $680 billion in 2008 to $2.2 trillion. McKinsey and Co. recently reported that Africa already has more middle-class consumers that the more-populated India. It all represents Africa’s longest income boom for 30 years, with gross domestic product growth rates averaging about 5 percent annually over the past decade. Even this year, as markets across the rest of the world collapse collapse, Africa’s income is projected to increase by around 4.5 percent. The International Monetary Fund estimates that the continent will have the world’s fastest-growing economy during the next five years. This has not gone unnoticed, with trade between Africa and the rest of the world increasing by 200 per cent between 2000 and 2011. This has not just involved the usual exports of oil, natural gas and minerals, but other sectors as well. Marcelo Giugale, the director of the World Bank’s poverty reduction programme for Africa, believes Africa could yet see even greater progress. Below, Tom Jackson details Africa’s seven fastest growing economies, all of which are among the ten fastest growing economies in the world. Ethiopia’s economy is growing ten times faster than that of the UK, having grown by 7.5 percent last year. It has been on a high growth trajectory since 2004. This expansion has been broad-based, with the services and the industrial sectors growing at the highest rates. This momentum is expected to continue in 2012 and 2013, albeit at a slower pace. The five-year Growth and Transformation Plan (GTP), however, which emphasises agricultural transformation and industrial growth, projects the economy to grow at much higher rates. In contrast to the 1980s, moreover, lack of rains no longer means famine. With the help of foreign donors, Ethiopia has put in place early warning, food reserves and distribution systems, and a safety net that supports the poorest families in their own communities. The year 2011 may well be remembered as a turning point in Mozambique’s economy, with the first overseas export of coal marking the birth of Mozambique as a world exporter of minerals, and paving the way for the country to secure its future fiscal sustainability through yields from natural resources. The boost in coal production from the first mega coal mining projects that came online last year, coupled with strong performance in the financial services sector, transport and communications, and construction, helped to push GDP real growth rate to 7.2 percent in 2011. The country has achieved an impressive average of 7.2 percent growth during the last decade. Tanzania’s economy has been resilient to regional and global turbulence and is expected to remain buoyant with a GDP growth forecast of 6.8 percent in 2012 and 7.1 percent in 2013 – well above the regional averages. Services, industry and construction continue to be the driving forces. Exports, which received a boost during the crisis as demand for gold in world markets continued to rise, are expected to perform well with growth forecast at 10.9 per cent and 9.7 percent in 2012 and 2013 respectively. Congo is another country whose economic growth has been on an upward trajectory, though GDP growth slowed in 2011 to 6.5 percent. This was as a result of global inflationary trends and a highly charged political atmosphere inside the country, and growth is expected to fall to 5.1 percent in 2012 before picking up again to 6 percent in 2013. However, it remains one of the fastest growing economies in the world. Growth is dependent on agriculture, the extractive industries, trade and construction and public works. Political uncertainties remain a major obstacle. Ghana’s GDP is expected to rise by nine per cent in 2012 — almost rivalling that of China. In 2011, the country made progress in consolidating its gains in 2010, as year on year inflation dropped to 8.7 percent and the fiscal deficit to 4.3 per cent of gross domestic product (GDP). The GDP growth for 2011 was aided by oil revenues and strong export performance of cocoa and gold. Future growth prospects remain strongly positive. Oil production and mining activities led industrial sector growth at 36.2 percent. This was followed by the services sector (5.8 percent) and the agricultural sector (5.2 percent). Zambia is one of the continent’s most promising economies, growing at 7.6 percent in 2010 and 6.6 percent in 2011. The technology boom has helped, along with its supply of copper, which now accounts for almost half its exports. Though it is still among the poorest in the world – it is ranked 164 out of the 187 countries on the UN Human Development Index – its economic success is starting to translate into better lives for its citizens. By 2009, the country had full primary school enrolment, up from 80 percent in 1990, and the latest figures show a decline in the infant mortality rate to 86 per 1,000 live births in 2009 from 88 in 2008. Nigeria has been a big player for years thanks to vast oil reserves. The country’s growth averaged 7.4 percent over the past decade and should be 6.9 percent in 2012 and 6.6 percent in 2013. Aside from its oil reserves, growth is also driven by the non-oil sector, particularly telecommunications, construction, wholesale and retail trade, hotel and restaurant services, manufacturing and agriculture. The government is expected to reach its target of getting inflation under 10 percent in 2013. The inflation rate fell from 13.7 percent in 2010 to 10.2 percent in 2011 following monetary policy tightening and the easing of food prices. Inflation is projected to ease to 10.1 percent in 2012 and 8.4 percent in 2013.